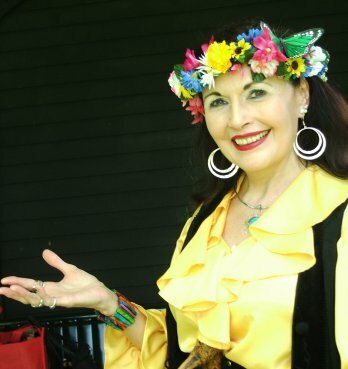 Storyteller Dianne Chandler weaves candlelight dramas cloaked in magic, illuminating multicultural folk-fairy tales, legends, historical and literary tales that touch the heart and bring a tear to the eye or elicit a good chuckle as they tickle the fancy of all ages. Although she loves the drama and magic of candlelit performances, Dianne is equally comfortable under the stage spotlight, in bright sunshine, or by a campfire and has enchanted young and old as a professional teller for more than twenty five years. She draws upon her years of experience as an educator, programme planner and curriculum writer when preparing for presentations and performances. With talking stick in hand, and dressed in various costumes to fit her stories, she uses props, songs and audience participation to enhance specific performances. Dianne believes that storytelling is a powerful healing force that connects us all in this disjointed world, and that everyone needs stories, adults as well as children. Raised in the green woods of Niagara and surrounded by peach blossom forests, as a child Dianne was always making up stories to tell herself. As a teacher, she told her pupils many stories for many years before discovering, through a chance university course, that she was destined to be, and indeed, had always been “a storyteller.” Since then she has been a featured teller at concerts, festivals, schools, libraries, churches, youth camps, art galleries, parks, senior’s residences, school literacy nights and house concerts across Ontario and beyond. She has told stories in Ontario, Quebec, England, France, North Carolina, Florida and California. In the past 10 years she has initiated, organized, directed, emceed and performed in over 50 concerts in the Durham Region area. Storyteller Dianne Chandler weaves candlelight dramas cloaked in magic, illuminating multicultural folk-fairy tales, legends, historical and literary tales that touch the heart and tickle the fancy of all ages. Equally comfortable under the stage spotlight, in bright sunshine, or by a campfire she has enchanted young and old for eighteen years. She draws upon her years of experience as an educator and programme planner when preparing for presentations and performances. With talking stick in hand, and dressed in costume, she uses props and audience participation and songs with younger audiences when appropriate. Dianne believes that storytelling is a powerful healing force that connects us all in this disjointed world, and that everyone needs stories, adults as well as children. Founder and artistic director of the annual adult storytelling concert "A Celtic Celebration To Welcome Spring" for the past five years. Founder and organizer for the storytelling and musical dinner concert series "Stories For A Summer's Night" "Stories For All Hallows Eve", "Stories for A Christmas Night"
Scriptwriter and storyteller of Durham Folklore Society's Education Commmitee's Multicultural programme for Whitby's Sesquicentennial, Fall 2005. Storytelling Toronto, Storytellers of Canada, Storytellers of Ontario, The Durham Folklore Society.